Four Sizes: Midge, Nymph, Medium, Large. Translucent plastic nymph ribbing and body material that has many uses for segmented bodies. Soft and easy to work with. The large size (hook size 18) is great for large stoneflies, streamers and saltwater patterns. The medium size (hook size 812) for stoneflies and large nymphs. The nymph size (hook size 1216) is good for small to medium nymphs and the midge size (hook size 1620) for midges and small nymphs. 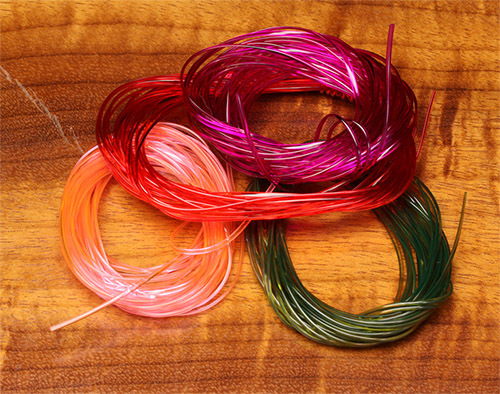 Hareline switched from spools to plastic packages. We still have many colors in spools.